For history-buffs there is really no city more fascinating than Athens, but whilst the city is known for its incredible historical significance it is also a place with a tangible creative energy. The Acropolis still lords over the city with many buildings in the city angled towards the iconic marble landmark but it’s not just the ancient culture that makes Athens such an attractive destination. The city is pulsing with art shows, live music, dance shows plus natural wonders such as the mineral-filled lakes and warm sandy beaches. Of course don’t forget to visit the other incredible antiquities like the Temple of Poseidon and the site of Ancient Eleusis. Ensure you live in splendour like a Greek god by picking from the best luxury hotels in Athens. 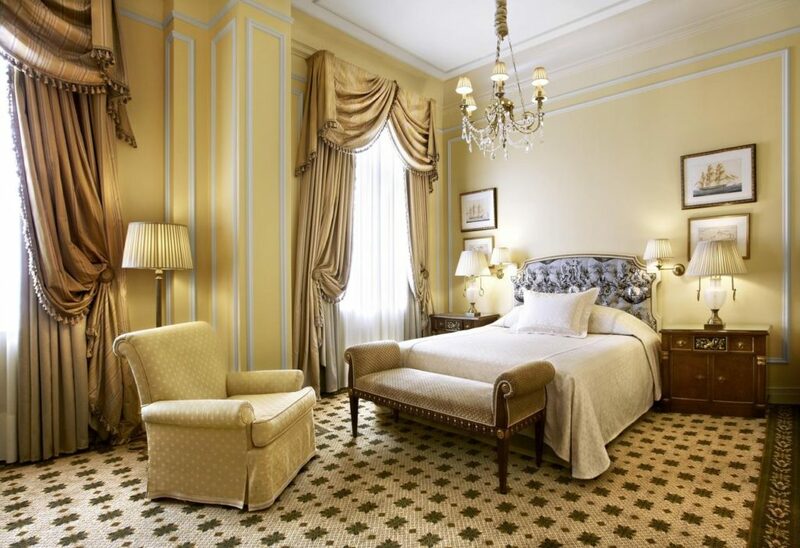 Located centrally next to Syntagma Square, the Hotel Grande Bretagne is a luxury hotel in Athens that was originally a residence built for a wealthy businessman in 1842. In recent times the hotel has had a full multi-million revamp to restore it’s former glory and it now has an indoor and outdoor pool a spa, a restaurant, a coffee shop and a number of attractive bars including a rooftop terrace where you can soak up the atmosphere of this vibrant city. With it’s cutting-edge modern design, The New Hotel has a unique style that made headlines when it first opened in 2011 as part of the ‘Yes!’ chain of hotels spearheaded by Dakis Iaonnou whose love of modern art is reflected in the funky, retro designs. Ultra comfortable beds are a feature, as are futuristic looking bathrooms with gold sinks that extend out into the room! The hotel has a spa, a gym and a number of excellent dining opportunities including The Art Lounge – a Mediterranean bar and restaurant on the top floor. 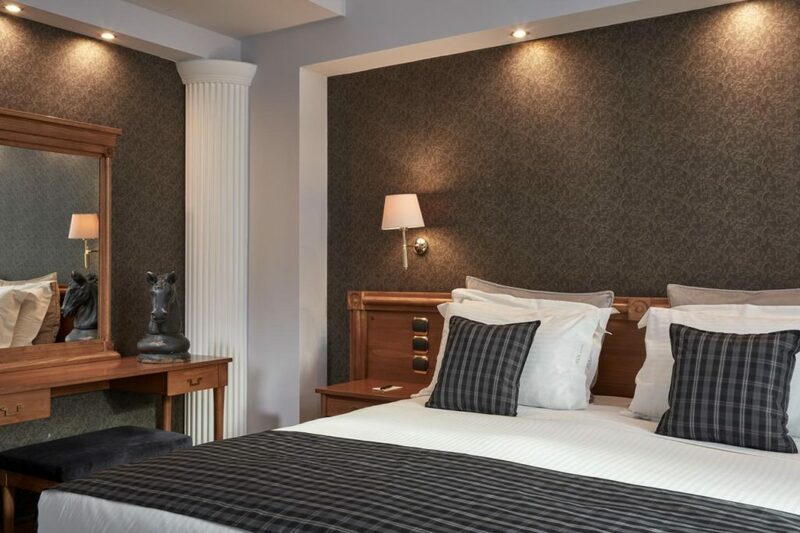 With a classy, sophisticated tone, this boutique hotel has a growing fan base of regular customers who love the mixture of modernistic furniture coupled with classic Greek art as illustrated in black and white photographs of ancient Greek statues. Rooms range from smaller sizes with work space and small balconies to more expensive suites each decorated in an individual style and with ample space and stunning views of the Acropolis from large balconies. Marble bathrooms come complete with luxurious Korres toiletries, and the hotel has a restaurant with a delightful interior garden for drinks, snacks or main meals. Near to the buzzing Plaka area but secreted away on a quiet road, the AVA Hotel and Suites is a small but perfectly formed hotel that is central to all that Athens has to offer for tourists and business travellers. Suites range from regular to larger executive and exclusive options, and the latter have living area, small kitchen and a large balcony. There is a subdued luxury throughout the hotel and each of the 16 rooms resemble apartments and are furnished in a bright, fresh style. 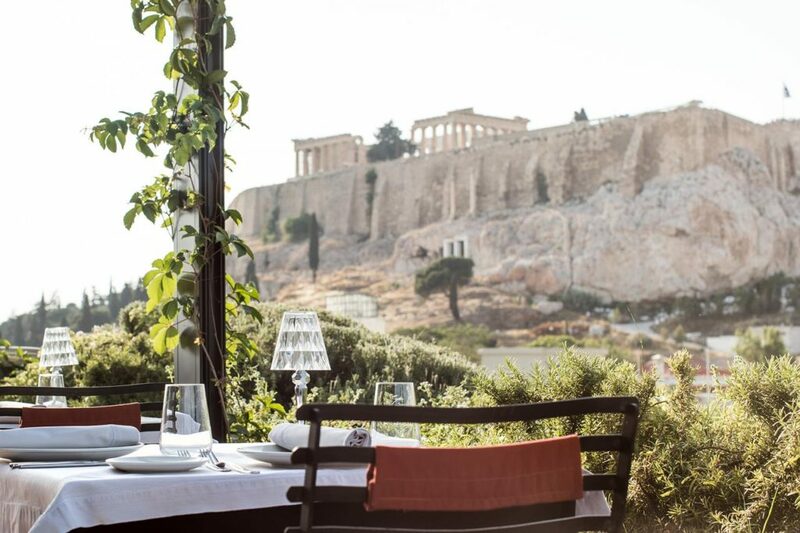 Views from the balconies include the Acropolis, Hadrian Arch and the Temple of Zeus, and a bottle of champagne is an added luxury that is presented to every guest on arrival. This hotel is set on a slight incline that gives superb views of Mount Lycabettus from the rooftop terrace, and which is also easily accessible for those interested in an early morning or evening stroll on the slopes. 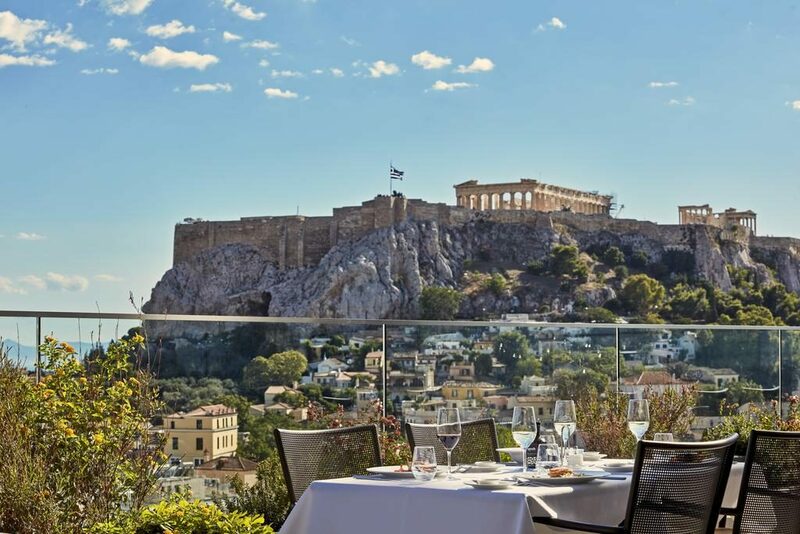 The hotel has a rooftop pool bar, a gym area and many rooms have great views of the magnificent Acropolis. There is also a spa with a pilates studio, and the rooftop restaurant has an unmissable panoramic view and a whole host of truly delicious dishes, and for those hot summer months the pool bar is a cool way to enjoy a relaxing drink. 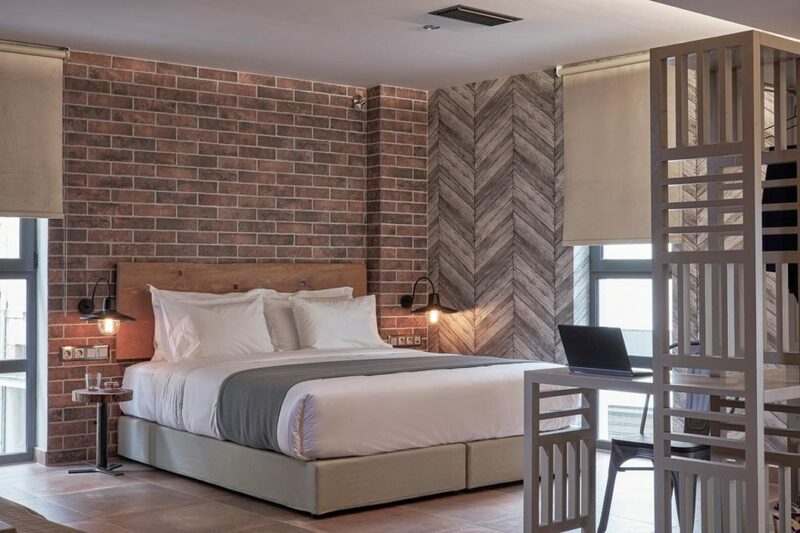 This unusually named hotel takes it’s inspiration from it’s Greek industrial past and was nominated at the 2018 World Boutique Hotel Awards. The designers have a thoughtful and ethical approach to preserving the history of the building and telling it’s story. All rooms have been designed using the 3 elements of construction – namely wood, cement and brick – to create a lovely effect of modern and traditional. 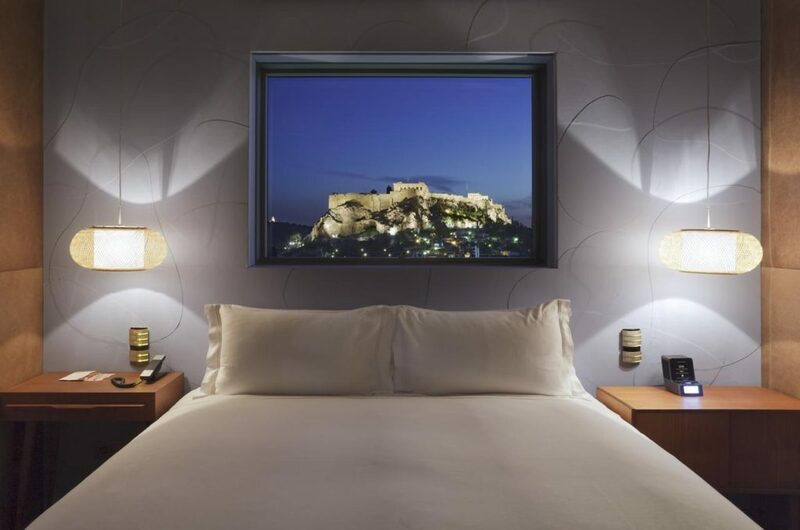 Many rooms have amazing views of the Acropolis and city skyline. 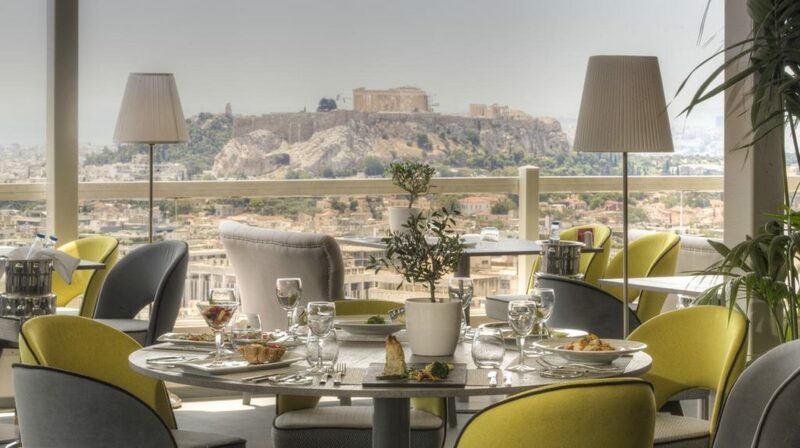 A luxury hotel near to the lively Syntagma square, the MET34 offers luxury suites with high-tech materials and a central position in the hub of the main shopping areas and historical attractions. Rooms have king size beds and marble bathrooms and are very spacious and ideal for groups of friends or family. The hotel is near to Syntagma and Monistiraki train stations and the location makes it easily accessible for the airport and Piraeus Port. The hotel also has a cafe style bar and 24 hour room service. 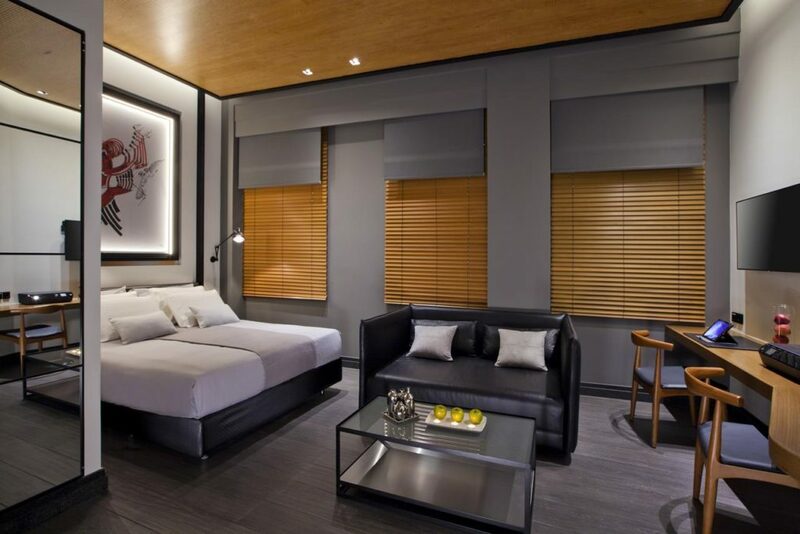 This former government building has been transformed into a hotel that is a hybrid mixture of chic 1950s and 1960s style with ultra modern touches thrown in to create a luxurious experience for guests. The tenth floor houses a stunning roof garden with panoramic views over Athens. The hotel has two pools including one on the roof, a spa area, and one of it’s main attractions is a striking piece of artwork in the inner courtyard atrium which consists of swarming birds and bees that rise up to over 30m in height, and guests can sit and enjoy the view over a coffee.